Dandelion vinegar, a photo by DivineMissEm on Flickr. Gracias Pachamana por la abundancia de primavera! I love making herbal vinegars and the dandelion flowers are PERFECT right now. It is such a lovely Spring food/medicinal as it gently and lovingly cleanses the liver as well as simply tasting delicious. 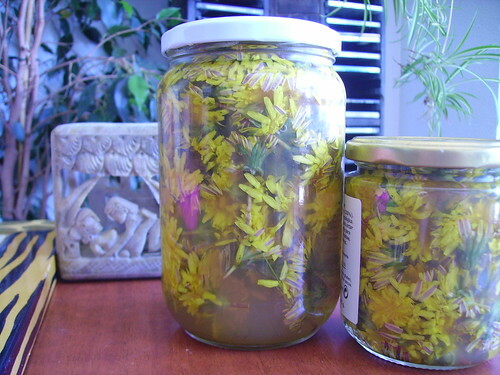 Another great thing about making dandelion vinegar is that when the vinegar is gone, you can eat the pickled flowers!